A quiet oasis just steps to everything in Victoria. Bright, lovely one bedroom apartment overlooking the landscaped rear courtyard in the heritage Union building in the very heart of Chinatown, downtown Victoria and steps from the lovely inner harbour, Galloping Goose trail as well as numerous parks and beaches. The bedroom has a queen sized bed, two huge walk-in closets, a chest of drawers and floor to ceiling windows looking out to the balcony and courtyard. The balcony is furnished with comfortable patio chairs and table. The open plan living-dining room is furnished with a sectional IKEA couch which converts into a queen bed and dining room table and chairs. A 43" smart TV, and Wi-Fi complete your comforts. The apartment features a well-designed layout with lots of light and views from all the rooms including the bedroom, modern kitchen with stone counter tops, stainless steel appliances, wide-plank flooring, luxury bathroom, hair dryer and in-suite laundry. Secure underground parking is included by use of a separate fob. Access to building is with electronic fob and the apartment features keyless entry using a coded door keypad. Access to the garage is with separate fob. We check you in electronically and are always available for questions and advice. We will check in with you upon arrival and also during your stay. If you have any questions regarding the apartment or for information about Victoria ,don't hesitate to contact us at any time. On departure please leave the building fob and garage fob (if used) in the apartment for the next guest. Thank you! We are both originally from the UK and have lived ion british Columbia since 1992 . We have 2 grown up children. We have been in the hospitality business for over 40 years and currently run a lovely B & B on Salt Spring Island ( Largest of the Gulf Islands) called Hedgerow House (Jayne is also an Iyengar Yoga teacher and we operate our own in house yoga studio for locals and guests alike. Our good friend Jayne Jonas ( contact details provided) who lives in Victoria is our local property manager and she is available to ask questions and handle any local issues. We were looking for a centrally located building that was close to everything Victoria has to offer while at the same time offers a quiet oasis away from the bussle of city life . The Union building fitted this perfectly particiularly as we face the garden courtyard rather than the street and are on the upper floor. We like the fabulous layout with a bedroom that actually ahs windows and an apartment that is modern, bright and easy to maintain. The added bonus of secure parking helps and the proximity to the harbour and all the cycle trails as well as the downtown area are all a bonus. 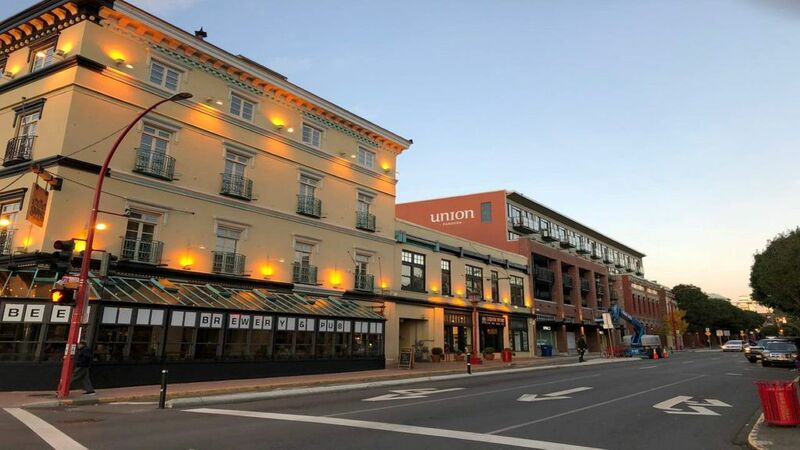 The heritage character of the building in the heart of historic Chinatown is great feature and the added benefit of an in-house coffee shop ( Bean Around the World) and a dozen great eateries within 100 yards also makes this place special. Spacious corner layout with stone countertop and breakfast bar. Excellent property. Very clean, comfortable, safe and well managed. Very caring manager and owners. This property is an excellent place to stay. It is quiet, very comfortable and safe. The condo offered everything I needed to prepare meals, to relax and just enjoy the area. The balcony and parking space are wonderful features that made my stay just that much more enjoyable.The location is perfect for visiting little unique shops, restaurants, coffee shops and the harbour. All within easy walking distance. Some almost right out of the front door! The manager and owners were very accommodating and sincere in their desire to make my stay everything I wanted it to be. Their attention to little details, that made my stay even more enjoyable and comfortable, were very much appreciated. Janet was a lovely and respectful guest. We would welcome her back to stay at our property anytime. Janet kept our property very clean and minded our house rules for which we are very grateful. The apartment is modern, stylish and well equipped. Being able to park in the building is an added bonus. From the location of the apartment, you can walk in all directions to find great stores, coffee shops and restaurants. We highly recommend this apartment. Our contact was Jayne and she was always available to answer to any questions we had. We had a fantastic time, the condo was very clean, in a super location, Ms.Jonas was nice to deal with; overall great experience. My daughter and I enjoyed a one week visit to Victoria January 2019. We stayed at the Union. It is in a great location and walking distance to everything we wanted to see and do and so many great places to eat. The room was perfect for us. It was spotlessly clean and very comfortable. Jayne and Peter were very accessible and replied to our requests promptly. We loved our visit! Very clean, well maintained and fully equipped, and the bed is very comfortable. Enjoyed our stay very much and found everything great. Within walking distance of the harbour, Provincial Museum, etc.. Tons of eateries and bars close by that were open even over Christmas. We enjoyed our stay. Right in the best downtown area, adjacent to Chinatown and many shops and restaurants. It would be helpful to have more than one key fob to access the building. In the centre of the city of Victoria just minutes to all the city attractions, the inner harbour, parks, museums, live theatre , numerous restaurants, cafes, bars and leisure amenities. Dedicated cycle path outside the front door connecting you to 100's of km of cycle paths.